Getting your customers in the door means winning first impression, no matter the quality of the product, while getting them to come back means showing them you trust them not to steal anything. Why every interaction you have with a customer is an opportunity to both build trust and show trust with them. How even the tiniest changes to the experience can drastically affect how a customer sees it. Why Twitter is like a couple of people sitting around the fire having a lot of conversations while the rest of the world tunes out. Sometimes the money spent protecting your merchandise can lose you more money in the end. Find ways to show you trust your customer, even if it means losing a .35 cent pen or two! Look at your business with a skeptical eye to see where you are accidentally belittling your customer or sending the message that you don’t trust them. An offended customer is one that takes their business to those who trust them with it. Descriptions can change your customer’s view of more than just the product. It can affect the entire experience from beginning to end. If a customer has to close their eyes to accept that it’s good, you need to change it. The same thing presented two different ways is two different things to a customer. Rumors about your company’s fate can, if you’re not careful, fulfill their own prophecy. How the almighty hashtag on Twitter trumps paid social on Facebook. Sometimes the difference between you and the competition is an algorithm. We’d love to hear about your great customer experiences, which segments you like, and your ideas for future episodes! Are You Looking for Things We Referenced? Is Twitter in 2017 Even Worth the Trouble? Welcome to Experience This! where you’ll find inspiring examples of customer experience, great stories of customer service, and tips on how to make your customers love you even more. Always upbeat and definitely entertaining, customer retention expert Joey Coleman and social media expert Dan Gingiss serve as your hosts for a weekly dose of positive customer experience. 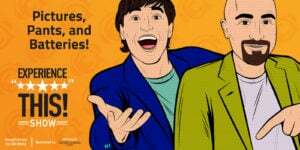 This show will help you attract and keep more customers so you can grow your business, increase your profits, and have more fun in the process. A fun collection of quick-hit segments filled with deep learning and takeaways, you don’t want to miss this audio experience! Love these characters! Joey and Dan break down the customer experience, uh, experience, in a fun way. Such a great pair! I have followed both of these guys online for a while and was stoked that they teamed up for a podcast. The podcast is super easy to listen to and provides a lot of insight that is actionable for my work. Excited for what is to come. Thanks Joey and Dan! Welcome to Experience This! where you’ll find inspiring examples of customer experience, great stories of customer service and tips on how to make your customers love you even more. Always upbeat and the definitely entertaining, customer retention expert Joey Coleman and social media expert Dan Gingiss serve as your hosts for a weekly dose of positive customer experience. Hold on to your headphones, it's time to Experience This! Get ready for another episode of the Experience This! Show. Join us as we discuss trusting your customers, minding what you eat and the plate of a certain blue bird trusting, eating, and tweeting. Oh, my. There are so many great customer experience articles to read, but who has the time? We summarize them and offer clear takeaways you can implement starting tomorrow. Enjoy this segment of CX Press, where we read the articles so you don't need to. Dan: He posted an articles on his website, Hyken.com, and it's called Do You Trust Your Customer and Do Your Customers Trust You? 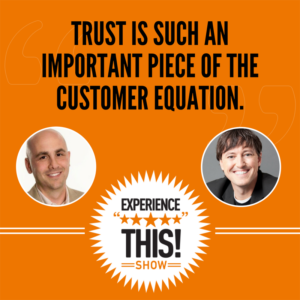 He talks about how customers want to be trust, but, too often, companies don't show that trust, and so they don't get trust back from their customers. Joey: Dan, in a move that was very near and dear to my heart being an Iowa farm kid, or at least growing up in Iowa, for all the people that actually know me, I didn't grow up in a farm, so I won't insult farmers by saying I grew up in a farm, but Hyken tells this story about a farmer who owns a fruit and vegetable stand, and what he does is he lets the customers pay on the honor system. For those of you that haven't been to the Midwest recently, what that means is they go over to a money jar and put in the appropriate amount of money for the fruits and vegetables that they want to take and, if they need to make change, they just make their own. He trusts the customer to do what's right. What's interesting is this method actually ends up saving his business money because he doesn't need to hire a cashier or buy expensive payment equipment. He shows his trust in his customers, they trust him back, and everybody gets along beautifully. Joey: Is there really more than one guitar retailer, but, okay, a leading guitar retailer. Dan: It's a leading guitar retailer. He walks in, and they have a desk there, and there's a full-time employee whose whole job is to check all the equipment that people bring in to the store and to make sure that they don't carry it along with them in the store. They're worried about people shoplifting. It turns out that this anti-shoplifting desk, as it was called, ended up costing the company way more money to manage and to staff than the value of the merchandise that they were losing from shoplifting and, in the process, they also ended up insulting some of their best customers, including the guitar playing Shep Hyken. Joey: I mean, I got to say, Dan, I'm sorry, this drives me insane. It drives me insane because what happens is we treat all our customers when we do this type of behavior like our worst customers. Right? The presumption is you're dishonest. The presumption is you're going to steal something. We've all had this experience walking into a store where they're like, "I need to check your bag," or, "You can't carry things from another store in here," and I'm thinking to myself how big of a problem is shoplifting and is this really the solution to ... It's kind of like the grownup version of the hall monitor, standing at the front door, and nobody really was excited about the hall monitor in school. We're not excited about the hall monitor in a retail organization. Trust is such an important piece of the customer equation. It takes a long time for a company to build up trust with a customer and get a customer to spend their hard-earned dollars there, and yet it's really easy to lose, which is exactly what the guitar store did. Dan: I'll give you another example, too, Joey. I was in a store one time trying to find some shoes, and this store decided that they were going to add a security device to the shoes. Unfortunately, the security device basically sat between the shoelaces of the two shoe, so I quite literally could not try on the shoes. Do you think they got my business that day, or do you think I bought my shoes somewhere else? Joey: It's so ridiculous. I mean, I get it. Retailers need to have some form of security because, yes, there are shoplifters. I get that, but you don't need to punish every customer you have just because of one or two bad apples. It sends the wrong message and, at the end of the day, it's heartbreaking that the behavior of one customer can ruin it for everyone. This is like when you go into a place and they say, "Our bathrooms are not for customers. They're only for employees." It's like, "Wow, thanks for the human decency." I think Shep even had this in the article, if I'm recalling correctly, a cartoon illustration of someone at a bank using the pen to fill out their deposit slip, and the pen is chained to the desk. I mean, stop and think about the message that sends. Right? This is the organization you've trusted to keep your money, yet they won't trust you to hold a 35-cent pen without chaining it to the desk. Dan: Exactly, and I think that what companies tend to forget is that this is all part of the customer experience, and this is ... You are basically telling your customers how to feel about your company, and so do you want them to remember your company by the fact that the pen was chained to the desk or do you want them to remember your company by something else, maybe that the teller was really friendly or that there were free lollipops or some other thing that contributed to the experience? Joey: Absolutely. Every interaction you have with a customer is an opportunity to not only build trust, but to show them that you trust them, and so I think a big opportunity for our listeners is to go look at your business with a skeptical eye and say, "Are we doing things that belittle our customers or that send a subliminal message to our customers that we don't trust them?" If you are, please stop doing that. It's better to trust them. Trust me, it'll all work out in the end. We spend hours and hours nose deep in books. We believe that everything you read influences the experiences you create, so we're happy to answer our favorite question. What are you reading? Dan: Joey, I am so excited to share this book with you. This is one of my favorite books of all time, and it's called Mindless Eating by a guy named Brian Wansink. This is basically about the psychology of food and how we eat and why we eat. Let me just set this up for you. What Brian did is he owns a restaurant that customers think is basically like a student chef kind of a restaurant, like a training facility. Right? Dan: They know it's a different kind of a restaurant, but, other than that, they really don't know why it's a different kind of a restaurant. As it turns out, the restaurant has two different sides and, almost every night, Brian is running some experiment that is between the two sides of the restaurant. Dan: Let me give you a couple of examples because I think they're absolutely fabulous. The first example is everybody who walks into the restaurant gets the same speech from the maître d'. The maître d' says, "We're so happy to have you here tonight. We'd like to offer you a complimentary glass of wine." Half of the bottle ... Excuse me ... half of the bottle. Joey: We'd like to offer you a complimentary half of a bottle of wine. This is why people love this restaurant. I get it. Dan: Right. You see, so the takeaway here is just give away free wine. Joey: Just give away free wine to all your people. Joey: Don't you love it? It's exciting. Dan: Half of the people get shown the bottle of wine before it's poured and they say ... and the maître d' says, "This is from a brand new vineyard in California." Joey: As Mid-westerners, we love this, North Dakota. As a kid who grew up in Iowa, let me just say we love you North Dakota, but we also know you might not be totally known for your wine. I'm not a wine drinker. Maybe they are well-known for their wine. Dan: They are not, and, of course, I'm sure you can guess, it's the exact same wine. Right? Dan: Everything else about the meal is the same on both sides of the restaurant. It's like a price fix kind of a thing. Right? Dan: What happens? Not surprisingly I guess, when the guests are asked after the meal what they thought of the wine, the people who had the California wine said they enjoyed the wine better than the people who had the North Dakota wine. All right, even if you don't know much about wine, I guess that that kind of psychology is fairly understandable. Dan: Where it gets weird is, when they're asked about the dinner, the people who had the California wine said they enjoyed the dinner far more than the people who had the North Dakota wine, the same dinner, and then when they went away from the surveys and they just went to observations, what they saw was that the people who had the California wine stayed and talked with each other at the table for an average of ... I think it was 13 minutes longer than the tables that had the North Dakota wine. The whole experience was defined and changed based on which wine they were offered when they walked in, and, of course, it's the same wine. Dan: Let me give you a couple of other examples because, I mean, I could go on for a while, but I just ... These are a few that I remember that I really, really liked. One of them was about a naval sailor who ... he was a cook on a submarine, and I believe this was World War II. Obviously, when these subs go down, they're down for a while, multiple days, even weeks at a time, and so he had to order all of his food at once. Apparently, one of the most popular desserts was jello, and so the sailors really liked jello, and he ordered both cherry jello and lemon jello. One time, his order came in and the only thing that was shipped was the lemon jello, and so he didn't have any cherry jello, and he freaked out because he was ... He knew that these 800 sailors loved their cherry jello and that he was going to be persona non grata if he did not deliver them cherry jello. Dan: I don't know if you can guess what he did, but he made lemon jello and he added red food coloring to it. Joey: Let's just make it look like cherry even though it's going to taste like lemon. Dan: Exactly, and not a single person was able to point out that it was actually lemon jello because, when we look at red jello, our mind tells us that it's cherry flavor, strawberry flavor or whatever, and that is actually what we taste. I actually tried this out in real life. I was overseas, and one of the things that ... somebody else ordered for us, and one of the things that was delivered to me was squid ink pasta. I don't know if you’ve had this. Joey: I had. It's tasty. Dan: It is black as night. Joey: Yeah, it kind of looks like you're eating spaghetti in oil, like not ... and not olive oil, but actual like automotive oil. Right? Dan: Like Exxon oil, yeah. Dan: You look at this and, I mean, I'll be honest, it does not look appetizing just because we're not used to eating food that is jet black. I remembered the book when I got this plate, and so I closed my eyes and I took the first bite, and it was delicious. As soon as I knew it was delicious, I could open up my eyes and it didn't really matter what it looked like anymore, but it was really hard to convince myself to try this jet black thing because it just doesn't look appealing, and you think about ... We both have kids, and kids will look at a plate and be like, "Nah, I don't like that." How can it be when you haven't even tried it, right? Because our brain's already told us that we aren't going to like it. Dan: One last thing that I thought was just awesome ... and, again, this whole book is filled with examples of these. I'm only giving you three. There's two dozen or more, but he also had a section on, which I thought was particularly interesting, on menu writing. On one particular night in this restaurant, he changed the menu descriptions of certain items. On one side of the restaurant, for example, he talked about something to the effect of "New England braised beef with whatever kind of sauce" and this description that sounded amazing. On the other side of the restaurant, the menu just simply said, "Meatloaf." Joey: Everybody liked the first restaurant or that side of the restaurant, the braised beef, delicious sounding, as opposed to the meatloaf, beef loaf. Dan: Absolutely, and that is one of the classic psychological biases, confirmation bias, right, is that you have ordered this delicious-sounding thing and so your brain kind of tells you, it confirms that, yeah, it's going to be really delicious. You order something called meatloaf, and meatloaf doesn't ... it just doesn't have that ring to it and sound as good. Anyway, I love this book because it just got me to think about things differently and to think about how even the tiniest changes to the experience can drastically affect how customers see it. Joey: Dan, I love it. I have to admit, when you ... First, I have not read Mindless Eating. Okay? This was a new one to me when you brought it up on the show today, and you've convinced me. I want to go read this. What I love about it is it proves the point of the What Are You Reading segment that we like to do and why this is on our show, because I know both of us inherently believe that every book you read as a customer service professional, a customer experience professional, somebody who's just interested in why human beings do the way ... do the things the way they do and how we can effectuate their behaviors by how we show up as an organization. This proves the point perfectly, and not only do I want to read the book, I want to go to the restaurant. It sounds amazing. Dan: Yeah. If you're going to the restaurant, it'd be pretty fun especially if you were trying to figure out what was happening. Joey: Yeah, and which side we were on, right? What we need to do is go to the restaurant and you have your meal on one side, I'll have my meal on the other side, and we'll try to figure out who is in the controlled group and who is being tested. Dan: I love that. I love that, and the side I hope I'd get ... There was one other story that you just reminded me of. I don't know why, but there was one other story where they actually rigged up something underneath the soup bowl where it continued to feed the soup bowl, so, as you ate the soup, it kept replacing it. Joey: The never-ending bowl of soup. Dan: Yeah, and, of course, not surprisingly, the people who were getting the continually refilled soup ate a hell lot more soup than the people who just got a bowl, and they didn't know what was going on, but if I go, I hope I get that side because I really want the soup. Joey: More soup for all my people. We usually see eye to eye, except when we don't. See if you find yourself siding with Dan or Joey as we debate a hot topic on this segment of Agree To Disagree. Joey: Okay, so, on pretty much every episode of the podcast, at least once if not multiple times, Dan makes fun of me about my lack of Twitter presence. For those of you that might be listening along and finding me on Twitter, you'll notice that I have 306 followers. Ironically enough, all of these came when I spoke at Social Media Marketing World earlier this year and, literally, all of those people started following me like within a day of the keynote. I was thrilled and honored to be a keynote speaker, but, for context, I've tweeted a total of 63 times, and actually it was my colleague Sarah that was tweeting, and I know, technically, in the world of tweeting, I'm not supposed to admit that, but like I was on stage and she was live tweeting from my account, so I think that makes it okay. If I broke the rules of Twitter, I'm sorry because I just admitted to the world of podcast. Dan: Obviously, Twitter ain't your thing. Joey: No, it's not, and I don't judge people that are on Twitter, but I just think it's kind of a waste of time. Dan: All right, so I’m coming up on 25,000 tweets. Joey: Where do you have all the time? 140 characters at a time. ... on how many characters I've used. You're better at math than I am. Dan: I mean, obviously, whatever it is we're about to agree to disagree, but what are we agreeing or disagreeing on today, Joey? Joey: I think we talked earlier about the changing face of the customer. I think twitter's changing as well, and not for the better. I think Twitter is kind of a waste of time and, if you're not big on Twitter, you shouldn't bother trying to get big on Twitter; and, if you are big on Twitter, you really need to start rethinking where you're at. I think it's a dying platform. Joey: It's really easy for me to talk smack. Joey: Not a good investment. Dan: ... and a lot of that has been because they have figured out how to make money. If Twitter is dying, which I don't think it is, it is because it hasn't figured out how to monetize not because it's a waste time or ... because it isn't great. For example, Twitter has become the source for news. I don't need to subscribe to multiple magazines or check multiple websites for news because all of those publications are on Twitter, and I can just follow them and get all the news that I want. Joey: That may be true, Dan, and I've certainly seen things, but it's also ... it's all the news from all the people, and I would argue that there may not be the credibility of resources that one would like. In these days of allegations about news, I think it's important to be a critical thinker. I think it's important to have multiple inputs on your news, but I just don't think it's there. I think one of the things you did mention about Twitter the company, I think sometimes the rumor of your demise can accelerate your demise. I think that's part of the problem. People aren't really sure where Twitter is going, from a leadership point of view. They're not really sure where Twitter is going from a money-making point of view. I think the days of being able to run a business year after year after year without making any profit are waning. I know that was kind of what Silicon Valley was built on, but, now, you have startups that ... and a lot of the VCs are looking at, "We want you. We're not interested in pre-revenue conversations. We want you to have money." I think Twitter is ... I think they're reaching the end of the rope there. Dan: ... it is, A, not making money, just like Twitter isn't, but, B, it does not ... It has a completely copyable product, which Instagram and, to some extent, Facebook have already copied, but I think Twitter remains unique because it is still the place for real time events. Whether it's Super Bowl and you're talking about the game or whether it's a hurricane that's coming or whether it's a war or an election or anything else going on, it is the place where people gather. It's the water cooler of the world to talk about topics with other people. What I found is that it's fantastic for connecting with people who share a similar passion. Joey: I'm going to need you to help me. Dan: ... that are about topics that you're really interested in and, frankly, whether you're interested in customer experience or in quilting, there is a Twitter chat for you, and you can meet other people who are interested in the same topic and have a discussion, and that's where you meet fantastic people, get new followers, follow new people that you're interested in and really kind of build your experience on Twitter. Joey: Fair enough, and I've heard about these so-called Twitter chats, and I know you're a fan, but our ... Speaking of friends, our mutual friend, Jay Baer, who used to be really pro-Twitter, and I think he's now kind of toned down his support a little, he actually posted a blog post the other day that quoted Rival IQ's 2017 Social Media Benchmark Report. Here's what that report found. A tweet to 10,000 followers will, on average, generate 4.9 engagement behaviors, so that's like, shares, comments, et cetera. That's it. I can post a picture of salad on Facebook and get more likes than 4.9. 4.9, I mean, that's ridiculous. The average banner ad click-through rate is 0.05%. What that actually means is that twitter's engagement rate is less than the click-through rate for banners. I mean, does anybody even click on banners anymore? I understand that maybe amongst the most actively involved, there's a conversation there, but I think it's ... There's a couple of people sitting around the fire having a lot of conversations and the rest of the world is kind of tuning out. Dan: Listen, I love Jay and have been accused by more than one person of having a bit of a man-crush on Jay. Joey: It's an easy crush to have. The guy is a dapper dresser. Dan: Yeah, so this isn't about Jay, but I will say that I disagree here. Look, from a business point of view, Twitter does not offer the same targeting capabilities that Facebook does or the reach, because everyone's on Facebook. Right? Those ads stats don't really surprise me, but what I think you're missing is that organic social media is basically dead on Facebook. Right? Facebook was brilliant. They got lots of companies to spend lots of money to build their follower base, and then they said, "Oop, and now you can't actually talk to those followers unless you pay us some more money," and, now, you post something on Facebook as a company and don't put any money behind it, and you're going to get about that same engagement rate because no one's going to see it, but, on Twitter, you still have the ability to post organically because of the almighty hashtag. Now, let me explain this to you, Joey, because I know you spent all of like three days on Twitter, but the almighty hashtag is a way that we sort conversation. What brands can do is they can hop on to hashtags that are already trending or hashtags that are related to topics about their brand, and this is how you can reach new people who basically go on to Twitter and search for a hashtag. That's how you ... Think of it as a filtering system. I'm interested in customer experience, so I'm going to look for #customerexperience or perhaps #cx, and that's going to get me to all the conversations on Twitter about customer experience. Brands can take advantage of this and they can do that, are you ready, for free. Yeah, you may not get as many engagements as you'd like, but when you're doing it for free, the economics changes a little bit. Joey: Yeah, oh, fair enough, it's an ... I give you that it's interesting economics conversation, but in the same way that the hashtag is kind of this iconic element of Twitter, that little blue bird logo is as well, and whenever I see that bird, I think of that as the blue canary in the coal mine. I think Twitter is tweeting its final tweets. Dan: Oh, my goodness gracious. Dan: I think that the demise is premature here because Twitter has also become a part of the fabric of society, and certainly in the US, but also, when you look overseas, Japan and other countries, it is absolutely huge. I mean, look, in the US, our president tweets. Everybody listens. Joey: Don't even get me started. Don't even get me started on that. I thought we would go this entire segment without talking about that, but okay. Dan: ... what happens after he tweets, all of the people will report on it. Joey: People cry. People cry. Joey: People cry after he tweets. Dan: It has become a ... I mean, think about just a few years ago, you never saw reporters at reputable publications like The Washington Post and The New York Times citing tweets as sources and yet, now, somebody tweets and it must be true and the tweet itself becomes news. The question of whether Twitter stays alive ultimately will be an economic question. Again, this is not a discussion about the stock market either or about the valuation of the company because I do think they've got a lot to do there. They have to figure out how to make more money frankly. I mean, they have to monetize it, but even if they can't do that, I think that Twitter's end is actually probably an acquisition by some other company that doesn't necessarily need it to be an advertising generator and that it can use it more as an asset. Dan: All right, Joey, listen, I got to go because I need to tweet. Joey: I don't think I will ever say that. Dan: Maybe you just had a bad case of hashtag FOMO. Go ahead and look that up after the show. Listen in while we try to stump and surprise each other with a fantastic statistic from the world of customer experience and customer service. It's time to Check Out This Number. Dan: Okay, Joey, the number for this week is 89%. What do you think that refers to? Joey: Dan, I'm picturing you back in junior high, and I'm thinking 89% is the chance that you were going to wear neon and look like a human highlighter when you went to the junior high dance. Dan: As a matter of fact, I was a fine dresser in junior high. Joey: Still are snappy, too. Joey: Thank you. Thank you, Oracle. Thank you. Dan: ... and their E-book, Digital Transformation, 3 Areas of Customer Experience to Invest in Right Now. Joey: Dan, this is music to my ears. So many people ask what really is the value of a successful customer experience and how does it really hit your bottomline. Folks, it's pretty simple. If you don't give a great experience, they're going to switch, 89% of them. It doesn't work in this day and age with as many options as there are, with as many places for them to shop online, at other brands, at other stores. If you're delivering a poor customer experience, you're going to see it hit your bottomline. It's not enough anymore that you're the only game in town because, frankly, you're not, so you got to get that experience right. Dan: The fact is customer experience is becoming the ultimate differentiator for brands because it's the one thing that's really, really difficult to copy if you have an amazing, memorable, remarkable experience. Speaking of amazing, memorable and remarkable, Oracle.com/connectedcx will offer you an amazing, memorable and remarkable E-book, Digital Transformation, 3 Areas of Customer Experience to Invest in Right Now, that is downloadable immediately for free with no information exchanging hands. However, if you give your email, you could pick up two additional customer experience reports. Thank you once again to Oracle CX Cloud for being the sponsors of the Experience This! Show. Wow. Thanks for joining us for another episode of Experience This! We know there are tons of podcasts to listen to, magazines and books to read, reality TV to watch. We don't take for granted that you've decided to spend some quality time listening to the two of us. We hope you enjoyed our discussions, and if you do, we'd love to hear about it. Come on over to Experiencethisshow.com and let us know what segments you enjoyed, what new segments you'd like to hear. This show is all about experience, and we want you to be part of the Experience This! Show. Thanks again for your time, and we'll see you next week for more Experience This! Episode 40 - Experience This! Episode 39 - Experience This! Episode 38 - Experience This! Episode 37 - Experience This! Episode 36 - Experience This!